Since his breakout movie Momento (2000), Christopher Nolan has not let up on his speciality of mixing up timelines to the frustrating dismay of audiences everywhere. 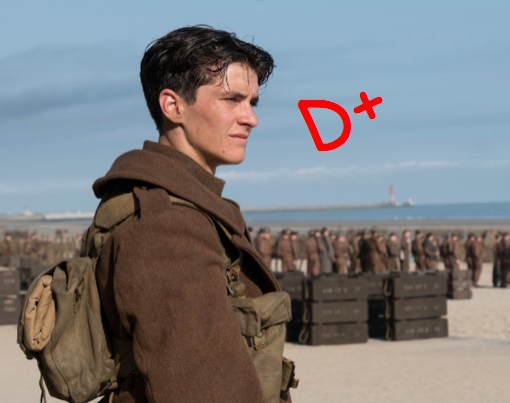 He does so here in his movie Dunkirk, a WWII thriller set in 1940 in the French city of Dunkirk on the border of Belgium where allied English forces are requisitioning small, private-owned boats to help stave off the German invasion and get troops across the channel. Everything in Dunkirk is muted in color, faded blue with distorting pale shades to go with. Every flashy color (such as jelly shining off of toast in a few quickly passing scenes) is a relief, but never long enough. The detail in Dunkirk is beyond excellent, but then, that's the problem; things are too spot-on, so much so that we become suspicious. Amidst the too-perfect haircuts of the young men as they flash by, we get to follow, in alternating chronological switch-outs, the characters, such as “Navy Commander Bolton” (Kenneth Branagh), “Mr. Dawson” (Mark Rylance), a rugged fighter pilot (Tom Hardy), and one improbably fortunate and handsome young man, “Tommy” (Fionn Whitehead) as he dodges more bullets than Jack Bauer. The enemy, the Germans, are never seen, but they are certainly feared. The flick is musically driven with unnerving tunes I’ve never come across before. This makes it not feel like a war movie or a history at all, but like a sleeper horror with a reliance on an invisible, tormenting force that only lets them live to tease them. You’ve never seen WWII material handled this way, nor have you been this confused by the what is laid out before you. As each of our featured survivors keep beating the odds in staying alive, the whole bit becomes repetitive with our growing less and less thrilled with each tragedy overcome. Despite great lengths gone through to make slow-simmer tension, we don’t care what happens to anyone. The dialog is sparse enough and the contexts drifty enough that we never get to grow on anyone, except when water is rising and a poor pilot is trying to get out of his waterlogged plane. Only then do we care; otherwise, it’s a terrific bor. I guess what I’m trying to ask is: How can a war movie be this badly messed up? !